The majority of the medieval manuscripts in Corpus Christi which contain Middle English prose came to the College as part of the bequest of Matthew Parker (1504-75), archbishop of Canterbury, who in 1568 had been given authority by the Privy Council to collect "auncient recordes and monumentes written" for "perusyng of the same". These manuscripts came from all over the south of England, having mainly originated in monastic libraries. Some were subsequently returned to their owners, but the majority appear to have remained with Parker and to have been considered his personal property, to dispose of as he wished. The majority went to Corpus Christi, where he had been Master from 1544-53. Of the 433 Parker manuscripts in the College, 48 are indexed in this Handlist. 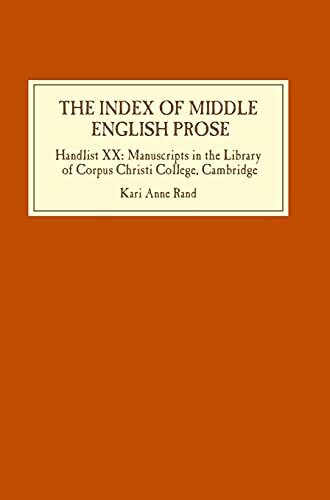 A further four manuscripts, derived from other sources, containing Middle English are also included. The texts range in length from jottings in the margin of the Bury Bible (MS 2) to a complete Wycliffite sermon cycle (MS 336). The great majority are religious texts; among those are the Ancrene Wisse, The Compendyous Treatise, Nicholas Love's Mirror of the Blessed Life of Jesus Christ, Richard Rolle's English Psalter, A Treatise of Goostely Batayle, Walter Hilton's Scale of Perfection, Beniamyn minor and the Treatise on the Seven Points of True Love and Everlasting Wisdom. There are also a large collection of fourteenth-century medical recipes, Chaucer's Treatise on the Astrolabe, Trevisa's translation of Higden's Polychronicon and William Worcester's Itineraries. Kari Anne Rand is Professor of Older English Language at the University of Oslo. Kari Anne Rand is Professor of Older English Language at the University of Oslo.